This is a little late for Thanksgiving, but hey, some people make turkey for Christmas, right? And who says stuffing should be relegated to Thanksgiving? ! 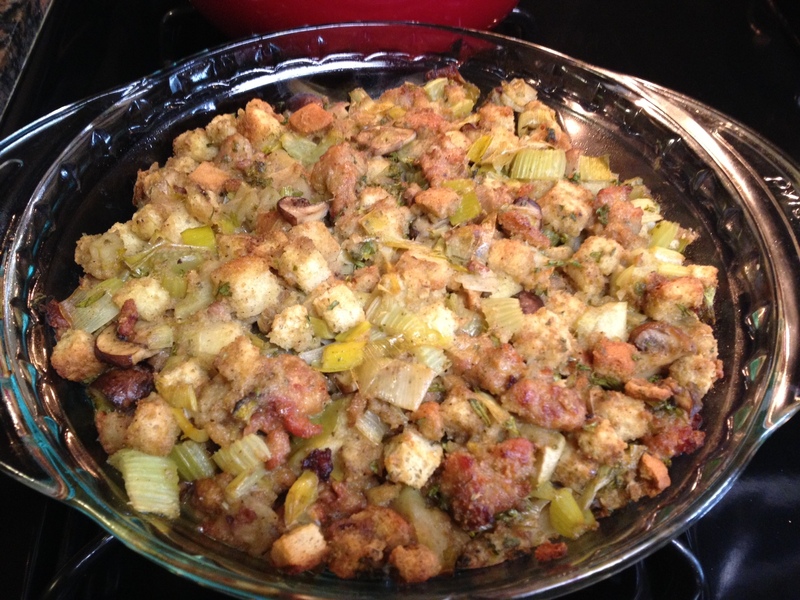 This is a variation of my go-to stuffing. I’ve used hot Italian sausage or bacon in the past, onions instead of leeks, and added dried cranberries. However you decide to make it, you can’t go wrong! In a large Dutch oven, heat the olive oil over medium heat. Add the sausage and brown, breaking apart with a wooden spoon. When the sausage has browned, remove it from the pot and drain off the excess oil from the pot. Add the breadcrumbs and sausage to the pot with the vegetables and broth. Stir to combine, adding more broth until the stuffing is moist. (I personally like the breadcrumbs to be almost saturated, with a little bit of crunch left in the middle.) Add the parsley and stir. Grease a 10-by-14-inch casserole dish and distribute the stuffing evenly in the dish. You can either bake the stuffing immediately or refrigerate it and bake it the next day. Cover the dish with a greased sheet of aluminum foil, and bake, covered, for 45 minutes. Remove the foil and bake for another 15 minutes.